In a surprise move today, Apple has actually approved the fastest (arguably) mobile web browser – Opera Mini for the iPhone platform. It will be available in the App Store for free in under 24 hours from now. This is what the CEO of Opera said in an official press release today. We are delighted to offer iPhone and iPod touch users a great browsing experience with the Opera Mini App," said Lars Boilesen, CEO, Opera Software. “This app is another step toward Opera’s goal of bringing the Web to more people in more places. 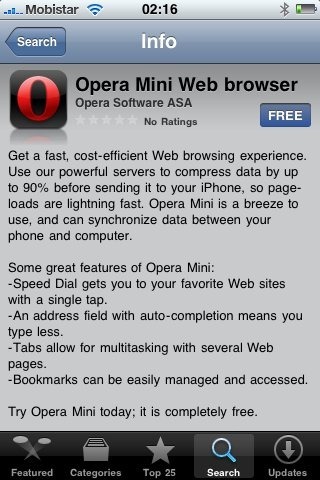 For those who don’t know what Opera Mini is, it’s a free browser by Opera itself for cell phones. Opera Mini has been the browser of choice by millions of users due to it’s high speed browsing and it’s amazing page rendering techniques. Opera showed off the Opera Mini on iPhone at the Mobile World Conference in Barcelona this year, and it was as appealing as Opera running on any other mobile platform like Android, simply superb! Not available in the Mexican Store yet. It is out go and get it! !